For tickets, contact Joshua Chan (0917 677 5141) and Gio Dexter Santos (0916 555 2782). The play, which earned Jose Rivera a 1993 Obie Award for Playwriting after its premiere in 1992, is born anew with the translation of Palanca Hall of Famer Rody Vera and the direction of up-and-coming dramaturg and director Erika Estacio. Marisol Perez is caught in the disorder of the world as she is left to fend for herself, without her guardian angel. The magic-realist dark comedy dramatizes the titular character’s story of survival in an ultraviolent, racist urban jungle in the middle of a cosmic breakdown — The guardian angels of the world have decided to wage a coup d’etat against a God gone invalid and senile, unable to hold the universe together. The play will serve as a poetic critique of our contemporary reality equally in shambles, reeling under the pseudo-dictatorship of a senile “God.” It seeks to reaffirm the triumph of humanity against adversity, profane or divine, and the need to reclaim our lost sense of beauty and order through revolution. The cast will be composed of purely student talents from the Loyola Schools. Besides Estacio and Vera, the artistic team also includes Tanghalang Ateneo Artistic Director Guelan Varela-Luarca, Tara Jamora Oppen (Assistant Directors), Mark Dalacat (Set Design), Darwin Desoacido (Costumes Design), D Cortezano (Lighting Design), Teresa Barrozo (Sound Design), Lucas Abaya (Graphics Design), and Dana Lee (Graphics Design). 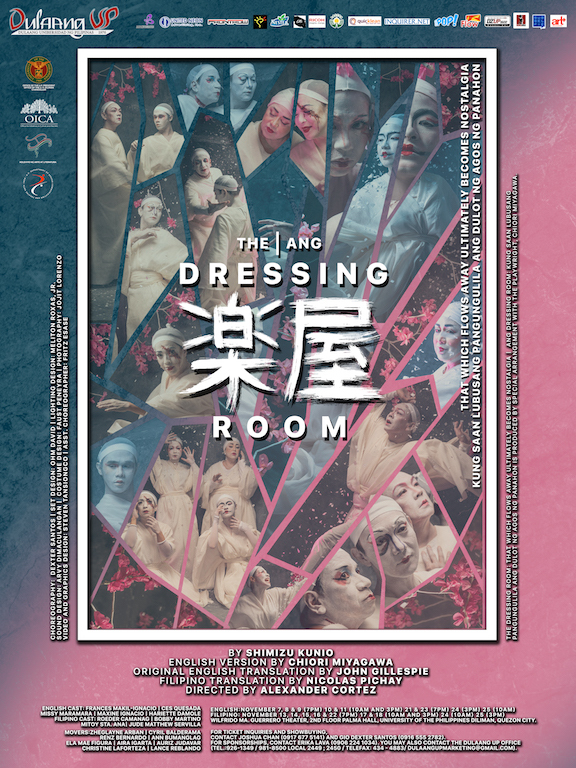 The show will run from November 15-18, 22-25 at the Doreen Fernandez Black Box, ARETE Arts Wing of Ateneo de Manila University. Ticket are priced at P500 for the general audience and P350 for Ateneo students. For questions and additional details about the show, contact Marco Guibone (09173129285). Banyuhay is a theatre festival that will be held on November 15 at the Asia Pacific College (APC) Auditorium, with shows at 2:30pm and 5:30pm. Tickets are free. Contact Clarisse Laranang (09751580281) or Mary Joy Mateo (09194997613) for inquiries. As the skies have been shrouded by darkness, so as the captives embraced agony. A pale man with a crooked smile enveloped with mystery. Playing the game is a risk to take, blinded by the rules he made. A bargain you can’t resist to take, think twice before it’s too late. You only have a single life to bet, so are you ready to play the game? Senior High School student Luke is convinced that he will be focusing on his academic life. However, Luke’s entire perspective turns upside down when he is reintroduced to his godmother, Mary, a well-mannered 42-year-old woman, is a childhood friend of Luke’s mother, Betty. A few weeks after she arrives to the country from abroad after the death of her husband, Betty invites Mary to help her prepare for Luke’s surprise birthday party. But on the same date when the event is successfully manned, his obsessive ex-girlfriend, Nicole, devises a mischievous plan on gaining back Luke’s love for her. While Luke does not recognize the collaboration, he finds himself locked in an empty room with both arms tied. A familiar voice looms from the background, and he soon understands the weight of his past. A well-known gay figure in the Philippines, Bernard gets featured in the most popular talk show there. When asked what led him up the stairs of success, he looks back. A few people tried to get in his way. Some tried to break him. Some lifted him up. But in the end, what really drove him to break through? Alice lost both of her parents at a young age. She learned to face her problems all by herself while leaning on alcohol and drugs. She was slowly drowning as time passed by and her cry for help are getting faint. She lives in her illusory vision of perfection making herself alien to her identity. A sharp blade is what she thought will be the answer to her problems, but one day, a push will reflect her dilemmas and make her realize it’s not too late. The guild restages ‘Ang Huling Mambabatok’, the musical inspired by the life of Maria Oggay, more famously known as Whang Od. Written by Em Mendez and directed by Romualdo “Raffy” Tejada, the production is a showcase of the art, culture, and traditions of Kalinga, from the past up to the present. This musical not only seeks to honor Whang Od: the legend who has preserved indigenous culture and art, but also to make her known as Whang Od, the Filipina who has lived a life full of dreams. The show will run from November 16-17, with shows at 4:30pm and 8pm at the Teresa Yuchengco Auditorium, De La Salle University Manila. For inquiries, contact Khaila Cruzada at 09175312481. 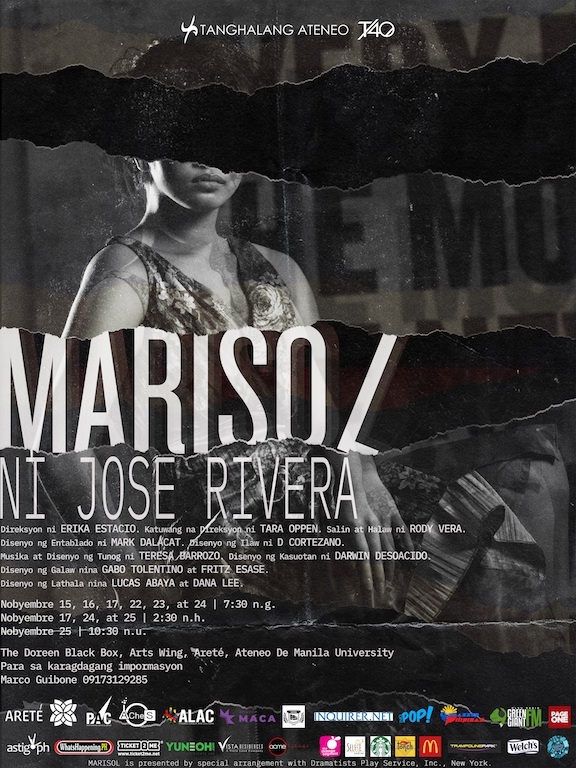 The show will run from November 26-27, with shows at 10am, 1pm, 3pm, 5pm, and 7pm at the Benavides Auditorium, Miguel De Benavides Building of UST. Contact Rey Rebollos (09567605022) or Marie Claire Zapanta (09276633112) for tickets. 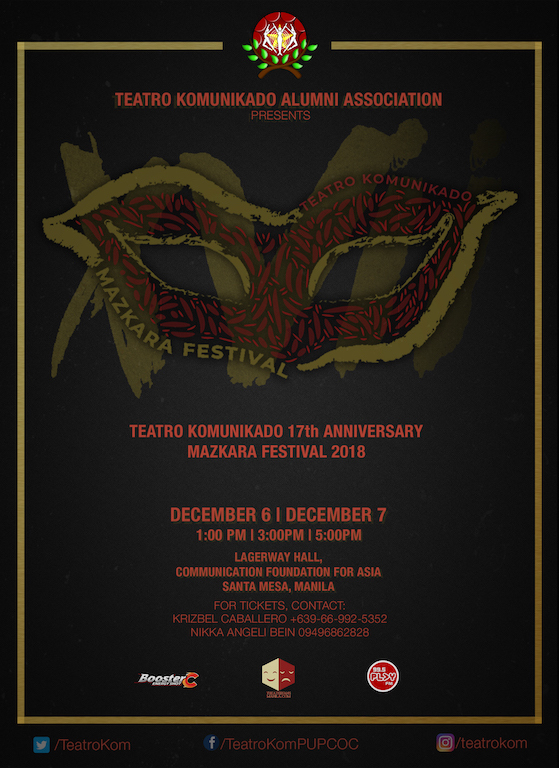 The Mazkara Festival is Teatro Komunikado’s annual culminating activity that consists of series of one-act plays. This year’s festival features 6 original plays entitled Magnum Opus, Due Date, Tong Hits, Personal Appearance, Huling Hapunan, and Koleksyon. Magnum Opus is a comedy that shows how a film production works. Gwen, a film writer, is fighting for the original essence of her script. However, the director and producer have a different vision for the film. See how they finish their Magnum Opus even with their opposing ideas. Due Date – The due date of an apartment bill reveals the concealed feelings of two live-in partners. Tong-Hits – Set in the slums, Tong-Hits is a comedy about Three Titas of Manila playing tong-hits during the wake of their other ‘kumare’. Personal Appearance – In a scheduled appointment with the Department of Foreign Affairs, the three passport applicants hope to find good fate outside the Philippines. Their stories and personal struggles are revealed through three monologues. 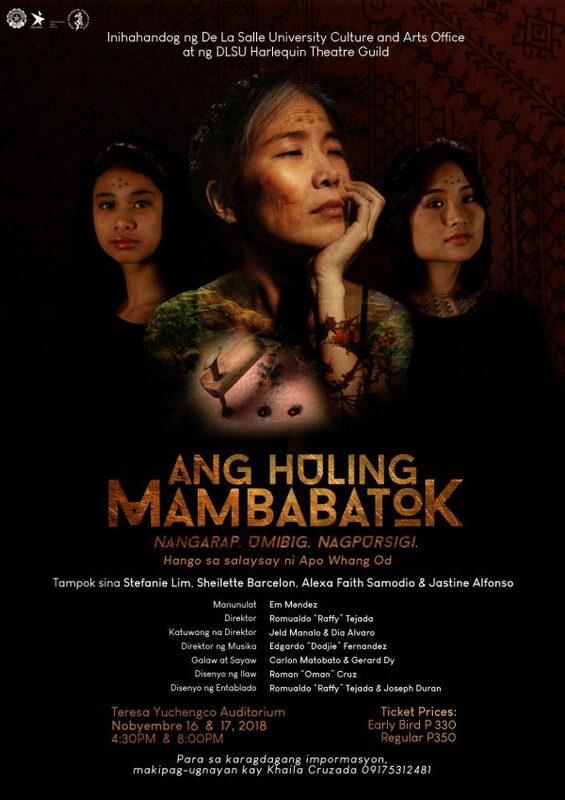 Ang Huling Hapunan is a family drama about Minda and her daughter, Lenlen. The story is set during their last supper before Minda makes a difficult decision that will change their lives. 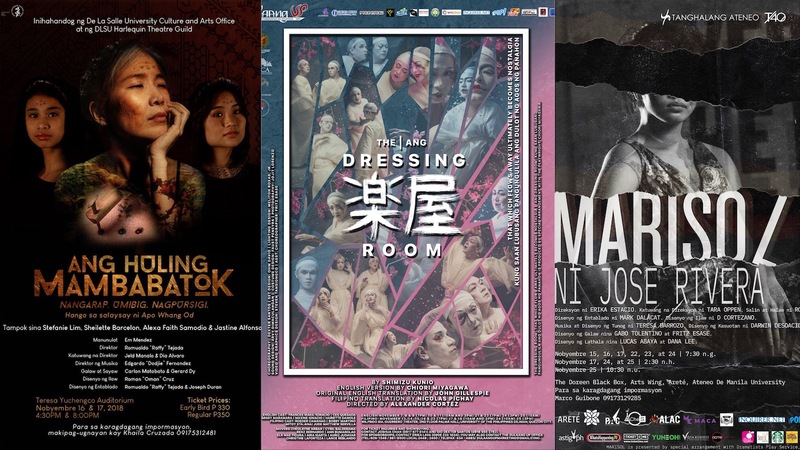 Koleksyon is a thriller play about Alex, a painter, who expresses her emotions regarding her personal life and her girlfriend through painting. 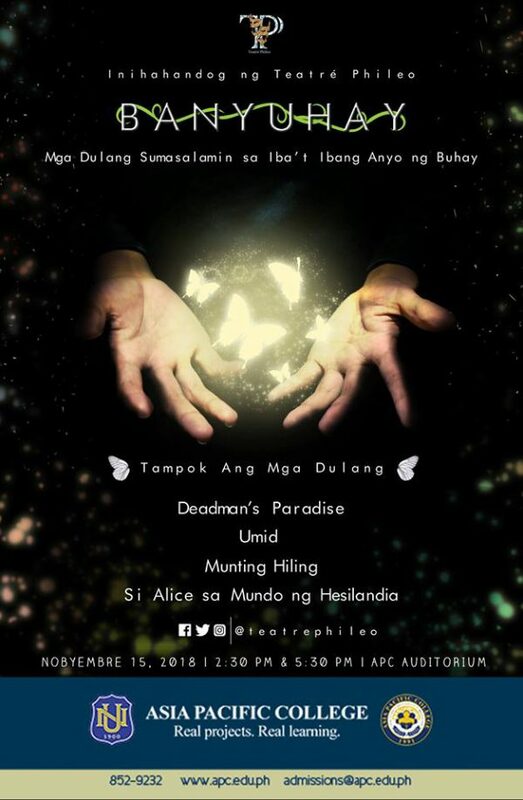 This festival will be held on December 6 and 7 at the Communication Foundation for Asia – Lagerway Hall, Sta. Mesa, Manila with 1 PM, 3 PM, and 5 PM shows. Tickets are priced at P50. Contact 09669925352 or 09496862828 for inquiries. 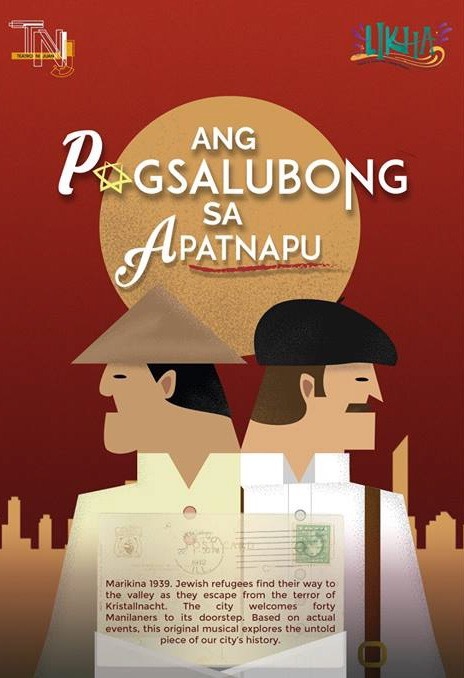 Inspired by true events, the musical commemorates the Philippines opening its doors- accepting the Jews who sought refuge from the terror of Kristallnacht. It was the efforts of President Manuel Quezon to welcome the ‘Manilaners’ to start anew by allotting a small piece of his property in Marikina, governed by Mayor Juan Chanyungco. Differences in traditions and language did not hinder them from cultural exchange. Building a diverse community, the Marikenos and Manilaners found themselves to be one and the same as the Japanese Imperial Army takes over the islands. The show will run from January 12-13 and 19 with 3pm and 7pm shows at Teatro Marikina, Shoe Avenue corner V. Gomez St., Sta. Elena, Marikina. Tickets are priced at P150. For tickets, contact Ms. Ana Rae Tambaoan +639050768071. Update, 11/23/18: The original version of this article included a show produced by Upsilon Sigma Phi. In light of recent accusations against the fraternity, our women-led editorial board does not deem it appropriate to publicize a production that supports and celebrates a group with a history of misogyny and violence.